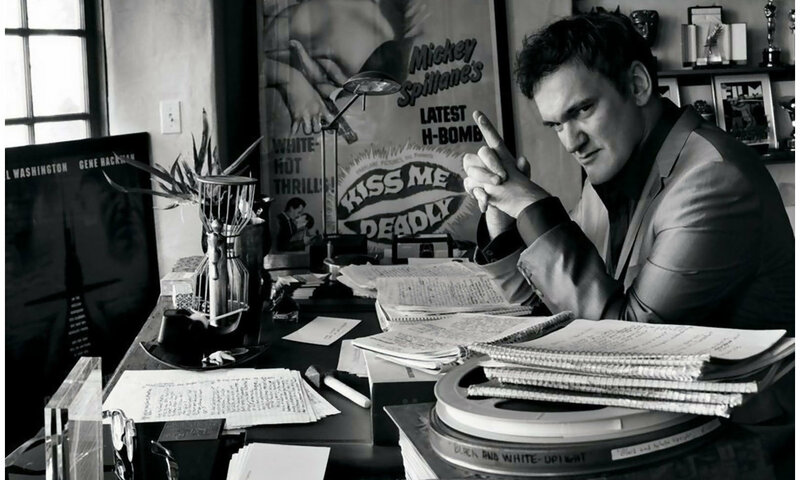 Your script is the key to opening the doors of the Movie Industry. And, as a first-timer only GREAT will do… Always remember, “Hollywood can get away with mediocrity but first-timers, like you, can not (Yes, life is not fair) for good is not good enough and only GREAT will do”. Never except the phrase, from someone who just read your screenplay, that “I really like it” or “your script is very good” or “congratulations, it’s a solid story”. These responses are not (I repeat “are not”) what you can call positive feedback. Because there are only two types of scripts and “very good” or “definitely like it” or “solid writing” is not one of them. The first type is… “It’s Great and Wonderful, I Couldn’t Put It Down” and anyone that reads it wants to then take immediate action and own this hot property by either (A) buying t, (B) funding it, (C) developing it or (D) optioning it and money (did you read that M-O-N-E-Y) comes your way. …and then proceed with “Act II is a little weak” (Hollywoodese for It S*cks) and “some of your characters need a little more fleshing out” (silent pause, when you stare and don’t know what to say) and end the meeting with “Very excited to see your next draft”… However, they will likely never return another phone call from you. You got one shot… better make it great. Upon writing, registering (WGA) and copywriting (LOC) your script it is time to send it out and you will only have 1 shot with each person you send it to, for if it isn’t great, then truly forget about ever having that person read wittingly another script from you… Thus, what you send better be great. Therefore, before you send your script to be read, to be sold, or to get an agent or try to get it produced or financed take the below SCREENPLAY TEST to see if it is GREAT. Please realize that your script, especially if it is only your first-draft, re-typed & tweeked six times in the past year is probably something that you will fall in love with. It is your first child, your first born and you are sure it is perfect. Be careful. Every parent believes their child is perfect but to others this kid might be just another “poop machine” so before you send it out, Please take this test, and hopefully, it makes you “Step Back” and “See the Forest From the Trees”. 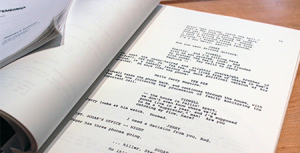 Take this 2-minute script test and discover how great it is. Answer 7 simple Questions (aka: 7 mini-quizzes). When reading your script do your eyes flow down the page, instead of movie left to right, line-by-line? If they go left-to-right, while reading, then you, the reader, are bored. 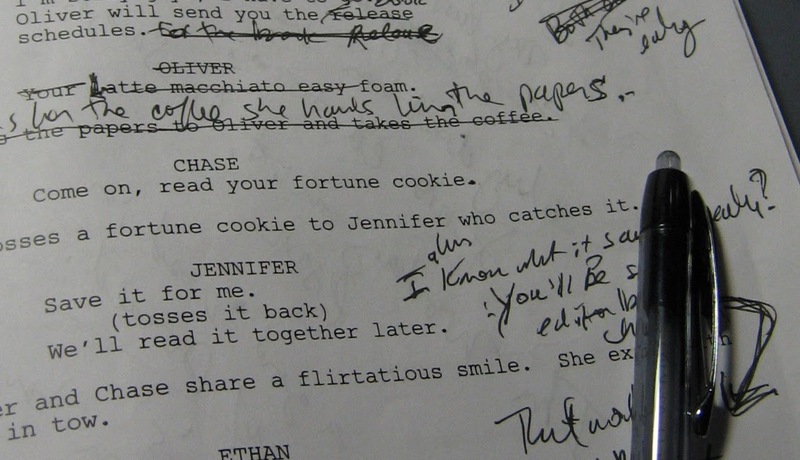 Please do not have to much exposition in your script. This is not a novel. Stop overly describing every scene. Readers & Development Execs will always tell you “Want to see a lot of white space”. Grab-The-Reader instantly: You must hook readers/viewers in the first 15-20 seconds. These are people that have read 500-1,000 scripts and have no desire to read yours. Thus, you better grab the reader super quick. Does something shocking happen in your script by Line 7-9 of page one to grab the reader? Or are you taking 3-5 pages to allegedly “establish” your characters and settings. Do you have a Grabber around Line 7-9 of Page 1? Make-Reader-Turn-The-Page: Does something happen, a 2nd grabber, at the bottom of Page one (one minute into the film) to hold the tv viewer through the commercials or grab the reader who really doesn’t want to read another bloody script from a nobody? Do you have a 2nd Grabber on the bottom of Page #1? Do you, when reading your own script, actually want to turn the page, after page 1, and are excited about what is on Page #2? Yes, it is correct most readers only read 10 pages… that is assuming they get past Page #1. Let’s be positive and assume your Page #1 is great (You have 2 Grabbers) and the reader turns-the-page to Page #2. Now, do the next 9 pages, your first ten pages make the reader to want more? Do you manipulate your reader, every 10-14 pages (or minutes, in tv 2 commercial breaks), with expecting something to happen, and then throw in a sudden twist out of nowhere…but is logical? This can only be accomplished by creating a proper Step Outline (aka: Beat Sheet) prior to commencing your 1st Draft. Is your script loaded with a roller-coaster ride of emotions and plot twists? Can you sit down and outline three reasons why each character is unique? Make sure your characters are not simple 1-dimensional stick figures. Everyone is not either Black (evil) or White (good). We are all some shade of grey. Now, does each of your characters have depth? Pick any page in your script. Put your thumb over the character’s name above a line of dialogue. Can you tell from just the dialogue which character is speaking? Can you even tell if the character is a man or a woman just by the dialogue? Test over. Now add up the score. It will be between 7-70. What did you come up with? 33? 48? 67? 68? If your score is anything but “70”, yes perfect, your script s*cks. 68 is close but not there. If it isn’t 70… then back to the drawing board for a re-write. If it is 70…now let’s find a reader who thinks like you. Remember, you are a first-timer and you have to be perfect. I know this doesn’t sound good but I was a reader. I read 1,000-1,500 scripts during 3-4 years as a Story Analyst in the ’80s and I guarantee you that a reader will only put forward a script to have his boss to read…. If-It-Is-Perfect. Thus, I guess it’s time for either a rewrite, or put the script away, and write another totally new script, and then, a year or two later, go back to your first script, that didn’t get a “70” score and try one more re-write. Want to Produce, Write, Direct? Want facts… not theory? $89-$389. Live, DVD & Streaming Formats. Sounds simple and understandble, but not easy!!! My script is for a social show–a movie everyone can participate in by making their own scenes for local screening within the current release (this is done with a GPSediting engine). As such it hits all the points except the full character development; you want to keep reading, you’re constantly surprised, but the characters are played by different actors within the script itself, and their stories are incomplete. How do I get this to the right person?